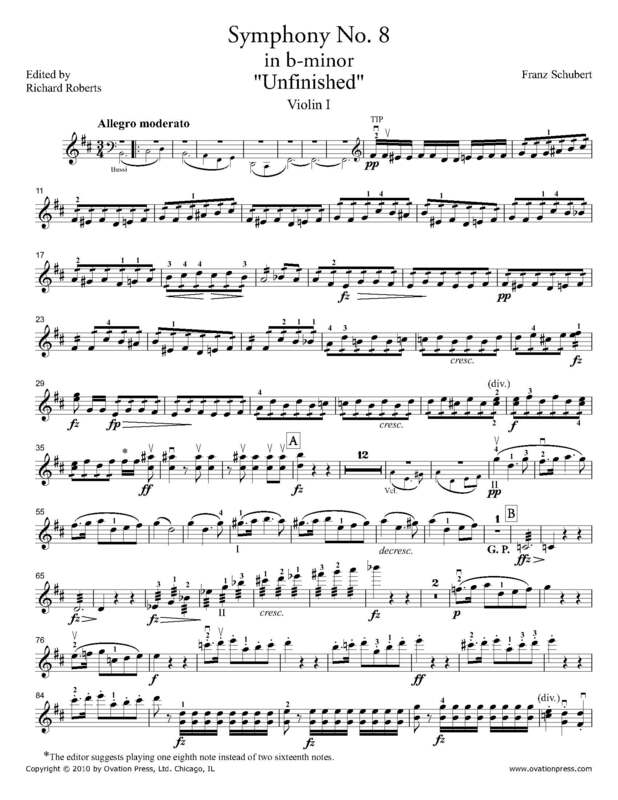 The first violin part for Schubert's Symphony No. 8 in B minor, D.759 (nicknamed the Unfinished Symphony) has been edited by Richard Roberts, concertmaster of the Montreal Symphony Orchestra. Roberts' bowings, fingerings and other editorial markings have been added throughout the score. Franz Schubert's Unfinished Symphony was started in 1822 yet never completed. The two complete movements of the Unfinished Symphony are a sonata form movement, which include a quietly sinister opening theme and dramatically climactic development section, and a smaller "sonatina" form movement with an extended coda. There are fragments of a scherzo intended as the third movement, and many have theorized that Schubert may have sketched a finale which instead became the B minor entr'acte from his incidental music to Rosamunde (though all evidence for this is circumstantial). Symphony No. 8 is sometimes referred to as first Romantic symphony due to its emphasis on expressive melody, vivid harmony and creative combinations of orchestral tone color, despite the architecturally imposing Classical structures of its two completed movements. To this day, musicologists still disagree as to why Schubert failed to complete the symphony. Even though Schubert's Symphony No. 8 lacks these two movements, its wide recognition and frequency of performance & recording seems to prove that the Unfinished Symphony can stand on its own two movements. Download and print the score today to gain access to expertly edited Schubert Unfinished Symphony No. 8 violin fingerings and bowings from Richard Roberts!